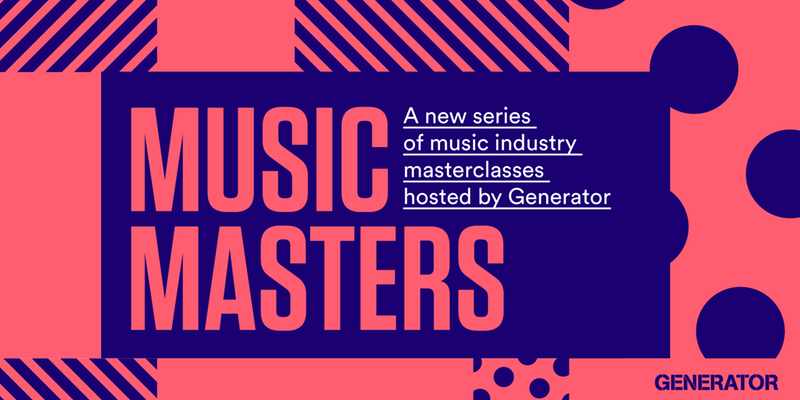 Generator & Tipping Point are proud to present the next event in our ‘MUSIC MASTERS’ series, our programme of high octane music business masterclasses covering all things industry from touring to branding, gigs to labels, self-releasing to publishing and everything in between. In this third iteration of the Music Masters series we will be focusing on PUBLICITY 101 as well as linking up with our WECREATE project – which seeks to shine a spotlight on the gender equality debate in music and the under representation of women in the music industry. This next masterclass will look at everything you need to know about print and press media coverage in the modern music industry and as always, a handpicked panel of industry experts will bring their knowledge of the media industry from a grassroots level upwards, ready to explain the often tricky situation of PR. If you’re a budding bedroom producer, an established act, or even representing an artist, you won’t want to miss out on this gateway to being heard by the right crowd, with a forthright analysis of specialist blogs up to the national print media. Please note that this event is free to attend but prior registration is essential due to limited spaces. WECREATE is a Generator and Tipping Point – run talent development project funded by Youth Music, PRSF and ACE that seeks to draw attention to the under representation of women in the music industry. It will do this by creating opportunities for female artists and emerging music industry professionals to develop creative work and pursue music industry career pathways. Opportunities are all free and will include workshops, courses, network development opportunities, artist residencies, industry sessions (with leading female contributors), music industry learning events and showcase opportunities. WECREATE will launch in partnerships with VIOLETS … a week of all female programming at COBALT Feb 27th -March 4th. Further details to be announced soon! The project is strategically connected to wider national initiatives and delivered through partnerships with Brighter Sounds’ Both Sides Now Project which is supporting women across the North, The Roundhouse (London) and the PRSF talent development partners network. Digital Futures’, Generator’s business support programme, is designed to meet the business development needs of the North East’s creative and digital businesses. This programme is part-funded by England European Regional Development Fund as part of the European Structural and Investment Funds Growth Programme 2014-2020.